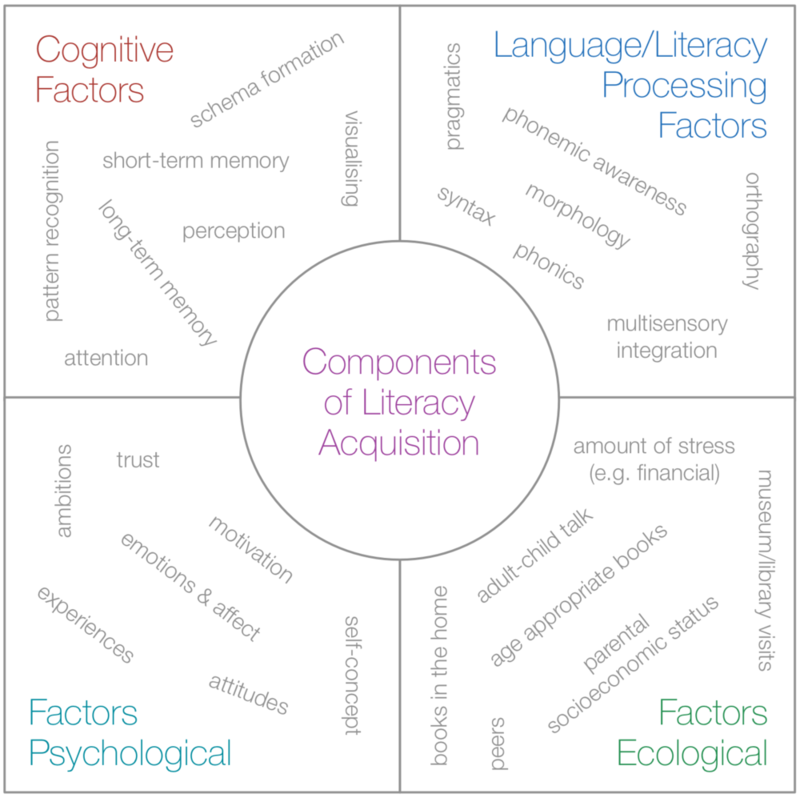 To contribute toward this aim, Gambrell, Malloy & Mazzoni (2011) identified ten features that comprehensive literacy instruction should include. Seven of the features are summarised in this journal entry. Click Read More below for the full discussion. In the previous entry, I suggested that different pedagogical approaches distinguished a skills-based perspective from a usage-based one. Both are required for teaching and learning. In the earlier entry, I alluded to the difference, but I didn't elaborate on this observation. To recap, a skill-based approach emphasises the ongoing development of language skills, such as phonemic awareness, spelling, sentence construction, reading fluency, vocabulary development and basic comprehension. 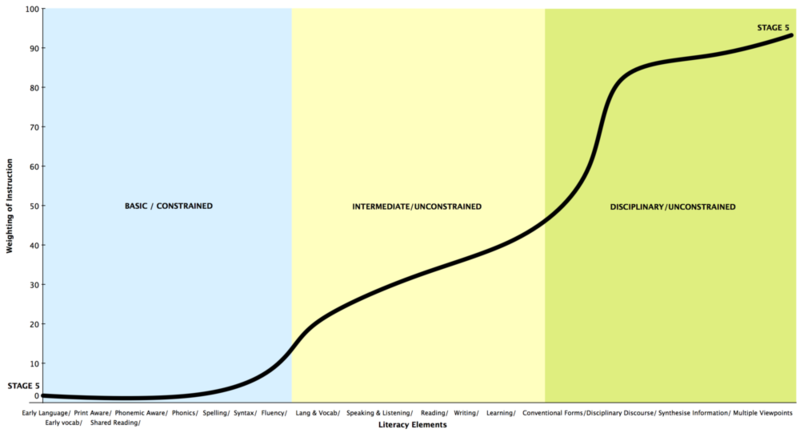 As a schema, this approach imagines a learner as progressing in a linear development of increasing sophistication. In such a perspective, a teacher is vigilant in monitoring the increasing competency of the learner and the teacher hopes to see his or her student acquire and demonstrate a robust knowledge of language. On the other hand, a usage-based approach emphasises use, for want of better term. The teacher seeks to present the learner with regular, rich opportunities to read and write in a range of ways, each of which helps the learner to read and write meaningfully. In such an approach, language knowledge is only one piece of the puzzle. The learner must also assess the situation or text, be guided in reading/writing to suit the situation or text, and develop certain intentions and expectations to guide purpose and comprehension. 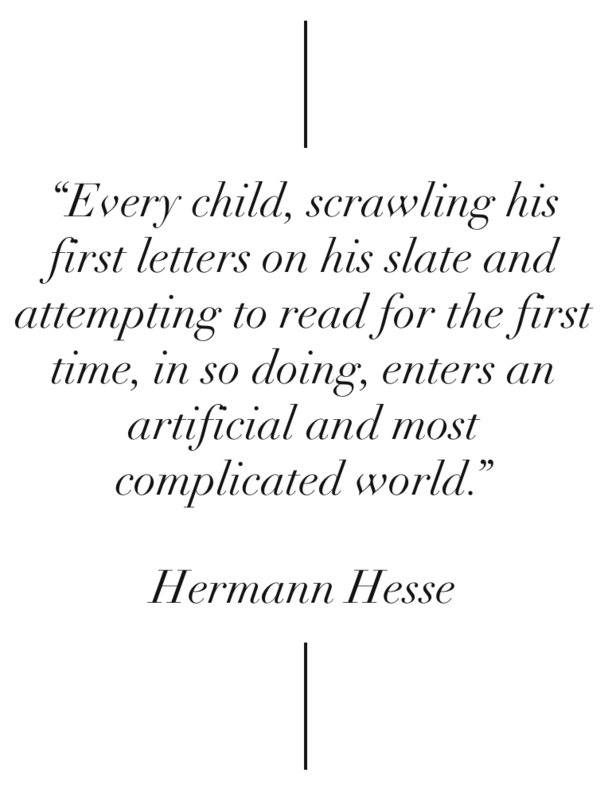 As a schema, this approach imagines a learner developing a repertoire of writing experiences and a library of his or her reading history. This approach is governed by the age-old saying, "we are what we read?" Why do I suggest that there is something of a paradigm shift? Dr Neil Anderson describes one (skill-based) as intensive instruction and the other (usage-based) as extensive instruction. A skill-based approach requires a teacher to be diligent, focused on detail, encouraging, exact and skilled at monitoring and assessing. 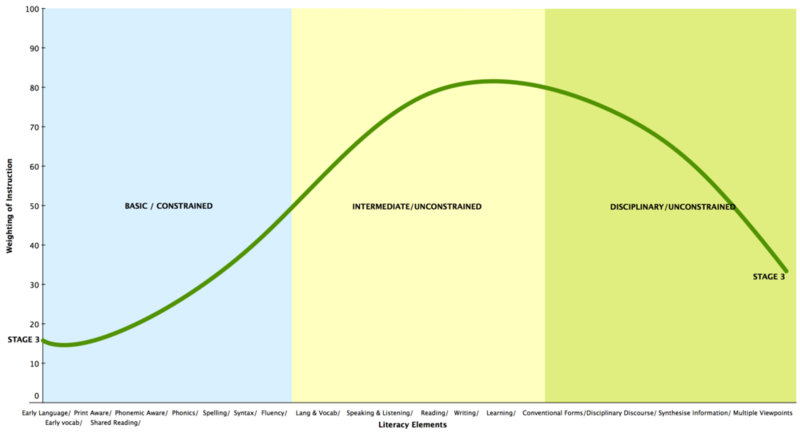 A usage-based approach requires a teacher who understands the importance of authentic, meaningful literacy; knows how to model and monitor the processes of reading and writing; knows how to establish opportunities so that activities are transformed to memorable events; and can reflect on what students should be able to read and write and why. A usage-based approach would declare, "my students have learned to Tweet. They not only write Tweets, but they are aware of what can be achieved through the use of social media." Meanwhile, a skills-based approach might be skeptical and wonder whether the Twitter skills are contributing to the students language knowledge, which - then - can be tapped into for further development. The usage-based approach may place too great an emphasis on particular forms of communication (but not as aware of the needs for the students to develop general linguistic abilities). At the same time, the skills-based approach needs to be aware of the ways to foster linguistic development through authentic practices. Similarly, I recently observed a series of writing workshops with fifteen enthusiastic Year 5/6 students. The facilitators of the workshops were definitely deploying a usage-based approach as they conjured a group environment in which students were announcing lines of poetry across the room for the creation of individual and group compositions. Amongst the energy, a student called for my attention and asked. "How do you spell 'splendid'?" I quickly assisted, but I was left to wonder, 'what if I was not called upon? Would that splendid line of poetry exist?' The above example reminds me of the reading experience. How many times have I witnessed exciting reading possibilities stopped in their tracks as the learner struggles to decode the text. Learners need both skills and opportunities. There is more yet to explore, but that must wait until another day. There is a concept in physics known as the Heisenberg's Uncertainty Principle. 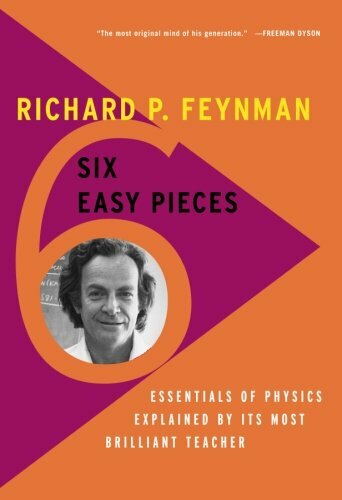 It holds that one can know the velocity of a particle and the position of a particle, but one cannot know both at the same time. In other words, one can know the exact velocity of a particle at a given time but not its exact position at that time. Similarly, one can know the exact position of a particle at a given time but not its exact velocity at that particular moment. 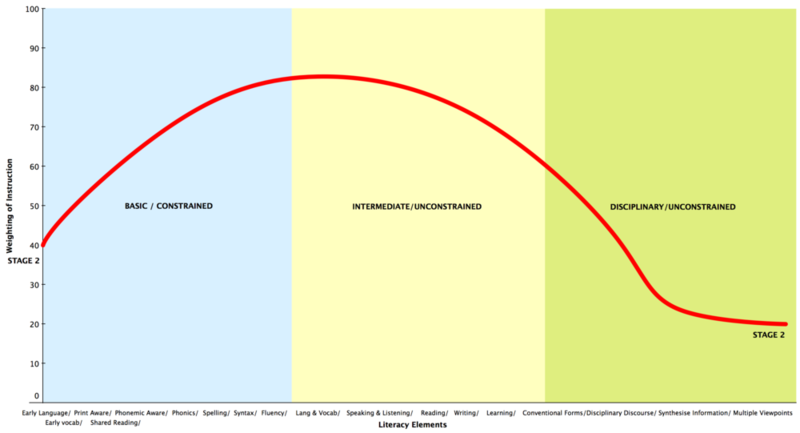 I am proposing that there is a similar phenomenon - at least, metaphorically - that occurs in the circles of literacy pedagogy, which I will refer to as (drum roll, please) the Parallel Dimensions of Literacy. 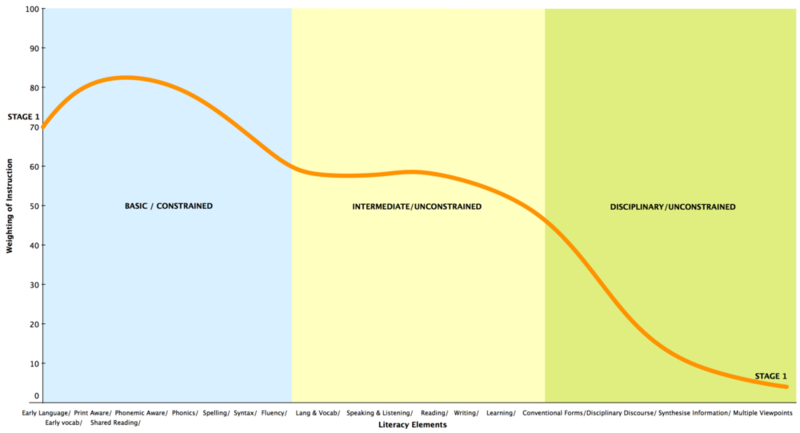 It holds that a teacher can foster a 'skills-based' literacy pedagogy and a teacher can establish a 'usage-based' literacy pedagogy, however, the teacher cannot use the same theoretical position to describe the two approaches to teaching. One must shift the paradigm as one moves between a focus on form to a focus on meaning. I am not suggesting that teachers must be one or the other. In truth, both approaches are required, and the best teachers at all levels are those who are equally equipped to develop and monitor core skills whilst providing rich opportunities for students to read, write, speak and learn in authentic, meaningful contexts. One can advocate for a skills approach which adheres to a deep knowledge of linguistic structures and focuses on structure development but which suffers from a decontextualised explanation of meaning that does not adequately address how conventional and cultural forms of meaning affect development. 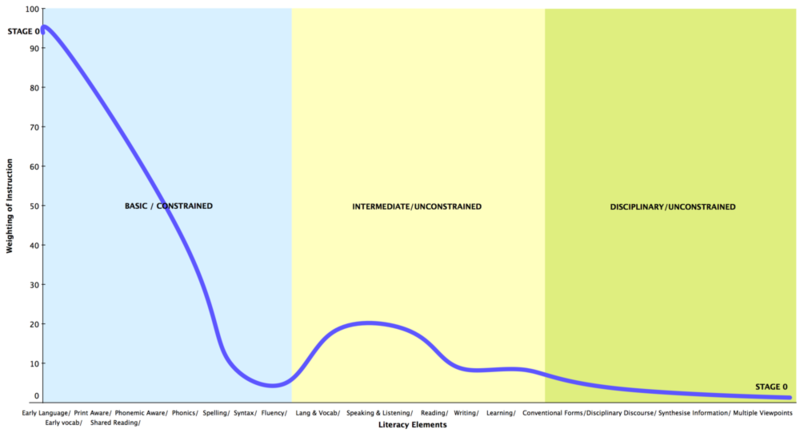 On the other hand, one can establish a rich environment in which learners explore (in reading) and express (in writing) knowledge and social activity, but the pedagogy can be seen to gloss over specific developments in phonology, orthography, morphology, syntax and grammar. 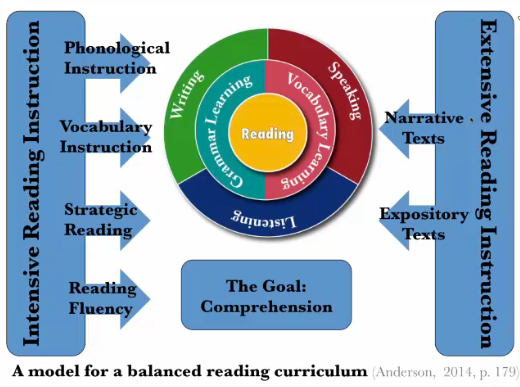 The diagram below (presented by Dr Neil Anderson) labels this contrast as Intensive versus Extensive Literacy Instruction.